Miguel yelled at Karla while he was staring at the bill that showed the “unauthorized expense”. “This is the reason why you can´t manage the money. You are useless and without me, you would be in ruins”. Karla agrees with that awful statement while she can´t keep the tears from going down her face. She hurries to say: “I’m sorry, I promise it will not happen again”. Karla’s head starts to wander with the idea that she is not worthy, not even worth lipstick. And in her mind, she begins to normalize that she´s to blame for not being allowed to manage money, not even pocket money! She had managed to return some groceries to the grocery store without Miguel’s consent in order to be able to save the few dollars she used for paying for that lipstick. Karla doesn’t realize she’s being a victim of domestic financial abuse, and that she is not the cause of his behavior. She blames herself for her current financial results, where she has lost her financial self-sufficiency and is fully dependent on her partner, Miguel. 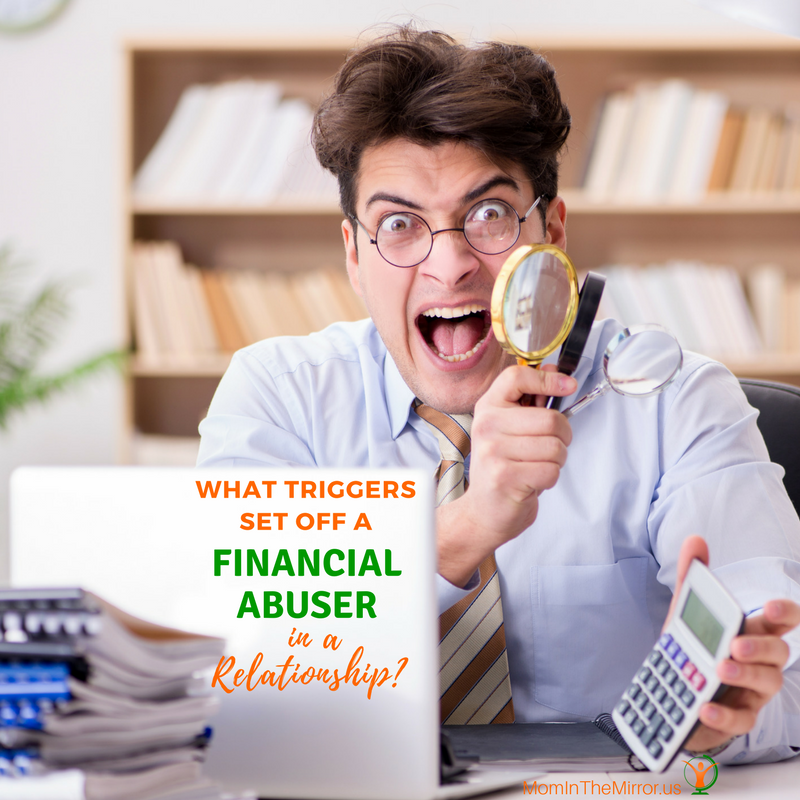 If you are in Karla’s situation or if you know someone who is in this financial trap, or you are wondering what triggers set off a financial abuser, let me tell you that you are not who is causing this financial abuse in your life. I can tell for sure because I witnessed it when one of my relatives—who I like to call Helen—was a victim of financial abuse. Helen´s ex partner used to withhold physical resources, including food, clothes, and medications from her, making Helen ask him for money while he made her believe that she was guilty for that situation. Finding out this form of domestic abuse had a huge impact in my life. I felt so sorry for Helen and the other Helens in the world that deal with a financially abusive relationship. The feeling of worthlessness, hopelessness and emptiness that drowned Helen, made me fell her pain and help her the way I could. it also lead me take the decision to build my life in order to prevent financial abuse from happening to me and helps other moms like you to prevent or get rid of it. When there is an abusive relationship, the abuser is the responsible for abusing his victim. He´ll behave the same way, no matter if it is you or another woman. Some of the causes of the domestic financial abuse are rooted to the characteristics and risk indicators presented by abusers, but others are related to common triggers that set off an abuser. According to Dictionary.com, a trigger is “anything, as an act or event that serves as a stimulus and initiates or precipitates a reaction or series of reactions”. As per description, triggers are not intended to be actions or events that “cause” the abuse itself, but they may stimulate—because of the abuser´s characteristics and personality—his abusive behavior. There are many triggers and here you have 7 of the most common related to domestic financial abuse. Trigger #1 ~ Disagreement with their intimate partner. If an abuser finds resistance to any decision he wants to impose in his partner, the abuser may get angry and start to be more controlling in order to keep you under his will. When they fail to achieve the results they want, such as a steady job and income—which could be provoked by protracted periods of unemployment—could make them externalize that frustration in form of abuse to his partners. Financial exploitation and employment sabotage can be activated by frustration. Trigger #3 ~ Financial issues. Negative mindset and self-talk about managing money expressed by the victim, such as “I can´t manage money” or “I´ve been unable to pay my bills” may lead the abuser to introduce financial abuse tactics subtlety. Even little mistakes committed by the victim may be used as the perfect excuse for them to start controlling your finances, as was Karla´s case. Trigger #4 ~ Desperation when partner threatens to leave. If his partner says or implies in any way that she wants to leave or is planning to do it, he may become more aggressive and demanding in his behavior, being more overt in his manner to control the household finances. Trigger #5 ~ Humiliation or failures. Being humiliated by family members, coworkers or friends, or having failed to succeed in something, could be devastating for them and provoke they begin to exert this kind of negative and abusive behavior to their partners. Trigger #6 ~ The lack of power and control. When experiencing situations inside or outside the house that makes him feel weak, they may look for other ways that help him to feel powerful and it can trigger their abusive behavior toward you. Trigger #7 ~ Substance abuse. The abuse of drugs and alcohol could also lead to escalate the financial mistreatment, by taking the household money to finance his consumption. Next time you find yourself feeling guilty for your partner’s financial abuse and wrong behavior, step back and take a closer look at his current situation. Search the list to recall what triggers set off a financial abuser and realize what are the triggers that are making him abusive to you. Being aware may help you realize the abuse early and start to battle it from a better position—a position where you´ll be feeling responsible only for your acts and understanding that everyone is responsible for their own acts and behavior, feeling brave from a position of strength and not fear. But what is more important, by knowing that you are a victim may help you to take the necessary steps to keep you and your children safe from your abuser. What other triggers do you think that can activate a financially abusive relationship? Share in the comments below.